St. Kilda is finishing all over the top of GWS. The Saints lead the inside 50 count 157 this quarter and it has generated nine scores to three from these. Jade Gresham has recorded five kicks and booted three goals since halftime. He recorded just one kick in the first half. The Saints have won 11 more contested possessions than the Giants this quarter and applied the same number of tackles. St. Kilda has scored two goals from eight defensive 50 chains this quarter. Blake Acres has grabbed two marks inside 50 this quarter to take his season tally to five. St. Kilda has now booted two goals from kickins. They have scored five points per game from this source this season. Billy Longer got on top of Shane Mumford in the third quarter. The Saints won the hitout (174) and clearance (13-6) counts but scored just one point from stoppages. That goal to Jade Gresham was sourced from a kickin. It was the Saints first score from 30 chains originating in their defensive 50. They have generated a score from 11 per cent of chains originating in their defensive 50 this season. Stephen Coniglio has recorded six disposals this quarter with four of them coming in a scoring chain for his team. The Saints have won four intercept possessions in their forward half this quarter and scored a goal from two of these. They scored just one goal from 13 intercept possessions won in this zone in the first half. St. Kilda has booted two goals from within 15 metres to take its season tally to 27, nine more than any other team. That mark to Rory Lobb was just the fifth for GWS in their forward 50. The Saints have conceded 12 marks per game in their defensive 50 this season, ranked ninth. Both teams combined to generate just one score from 38 chains originating in the defensive half in the second term. The AFL defensive half score percentage average is 13 per cent per game. Greater Western Sydney won six hitoutsto-advantage to one that quarter but lost the clearance count 10-17 and were outscored by 17 points from this source. That mark to Jack Billings was his team's first intercept mark this quarter after grabbing eight in the first quarter. The Giants have scored 16 points per game from intercept possessions won in their forward 50 this season, ranked No.1 in the AFL. They have scored 13 points from this source this quarter. Greater Western Sydney has won nine intercept possessions in its forward half this quarter and generated a score from four of these. 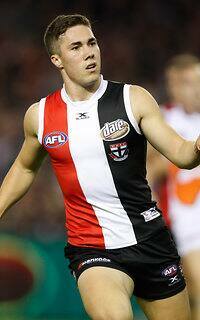 St. Kilda has scored 26 points per game from clearances this season, the fourthfewest of any side in the competition. They have scored 33 points from this source tonight. The Saints lead the clearance count 103 this quarter and they have outscored the Giants by 11 points from this source. Giants InterchangeNathan Wilson off due to an injury. St. Kilda has applied six pressure acts and three tackles in their forward 50 this quarter, and generated two scores from three intercept possessions won in this zone. Giants InterchangeJacob Hopper off due to an injury. Jimmy Webster turns the ball over in his team's defensive 50 and is punished by a goal. The Saints have conceded 11 points per game from intercept possessions in their defensive 50 this season, the eighthmost in the AFL. The Saints have won the first two clearances this quarter with the second launching their sixth score from this source. St. Kilda generated six scores from their 11 inside 50s in the opening term. The Saints have generated a score from 55 per cent of their inside 50s this season, the secondhighest percentage recorded by any side. The Giants have launched two scores from their four kickins. They have launched a score from eight per cent of their kick-ins this season, the sixth lowest percentage of any side. 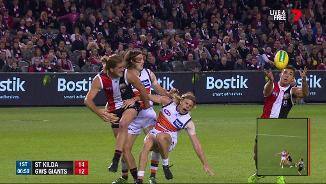 GWS have won the last three clearances and scored a goal from two of these. Giants InterchangeAdam Kennedy and is possibly out for the game. St. Kilda has now won five clearances and launched a score from four of these. 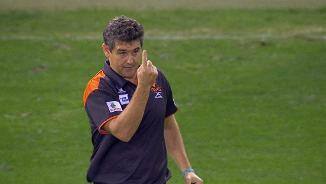 That mark to Dylan Roberton was his team's sixth from a GWS kick. The Giants have conceded 13 intercept marks per game this season, the seventh fewest in the competition. That goal to Tim Taranto was sourced from an intercept possession won in his team's forward half. It was the Giants first chain originating in this zone. The Saints have won the first four clearances of the game and launched all three of their scores from this source. St. Kilda has scored 26 points per game from clearances this season, the fourthfewest in the AFL. The Giants boot the first goal of the game, sourced from a kickin. GWS have generated a score from 12 per cent of chains originating in their defensive 50 this season, the fifth highest percentage in the AFL. 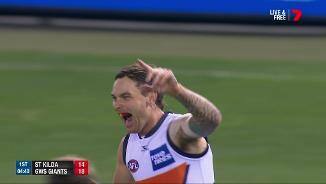 GWS have won 17 more contested possessions per game than their opposition in 2017, the secondbest differential in the competition, and the clearance count by 11 per game, ranked No. 1. St. Kilda has applied 264 pressure acts per game in its forward half this season, the most of any side in the AFL, and it has won 28 intercept possessions in this zone, the secondmost. Welcome to Etihad Stadium for the St Kilda v GWS Giants Round 7 clash. 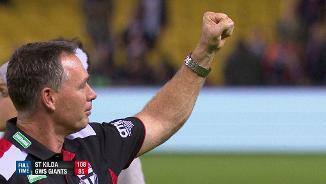 IN THE evolution of St Kilda, this was the win the Saints just needed to have. Against a genuine premiership contender? Tick. With a group of emerging youngsters dominating? Tick. Without a reliance on the older brigade? Tick. And on Friday night? Well, that was just a bonus. The Saints' 23-point victory over Greater Western Sydney at Etihad Stadium was the scalp the building club needed to claim as it strives to push up the ladder. And it had a bit of everything. Trailing by 17 points midway through the third term, the Saints rose to the challenge, booting 10 of the last 13 goals to post the 16.12 (108) to 12.13 (85) win. St Kilda was led to the win by a midfield that was tougher and more consistent than their more highly-fancied rivals. Seb Ross was dogged, Koby Stevens added grunt and Jack Steven was close to best afield with 29 touches and two vital last-term goals. Jack Billings (22 disposals, 2.3) was also excellent. He was St Kilda's best player in the opening term and continued throughout in a consistent display through the midfield and half-forward. His time is coming. Pleasingly for coach Alan Richardson, this was a win for (and by) the new Saints rather than the old. 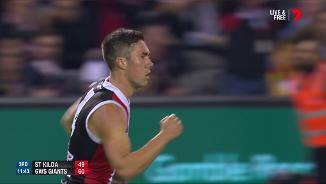 It was Jack Sinclair (23 touches), Blake Acres (23, two goals) and Jade Gresham (three goals) who stood up when the Saints needed game-changers, with veterans Nick Riewoldt and Leigh Montagna relatively quiet. "It was a really positive result. 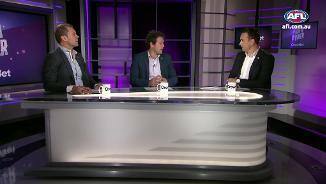 I challenged our midfield after the Geelong game. 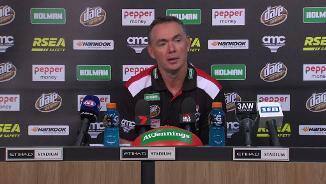 We fell away once again late in the game against West Coast over in Perth and that was a message at three-quarter time," Richardson said of the Saints' excellent finish. "We needed to be strong, we needed to learn our lesssons." It was a defeat that may come back to haunt the Giants, who arrived in Melbourne as favourites to add to their five wins so far this season. Dylan Shiel (28) and Callan Ward (28) were among the Giants' best, while Devon Smith was also excellent with 25 disposals and a goal. In his first game of the season, Stephen Coniglio also had 24 disposals, nine tackles and a goal. Already hit by injuries and suspension, the Giants lost defender Adam Kennedy early in the game to a suspected serious knee injury that limited their rotations for the rest of the contest. He looks set to miss the rest of the season with fears he has torn his ACL. 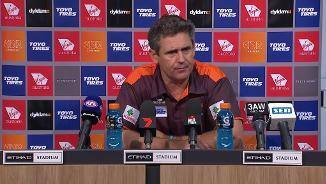 Coach Leon Cameron said the Giants were overrun by a hungrier opponent. "Credit where credit's due. It was an arm wrestle up until five minutes into the last quarter then they just took over," he said. The Saints looked on early, but Greater Western Sydney's 10-point advantage at the first break seemed about right: where the Saints were physical and competitive, their opposition was slick, quick and constantly dangerous. Whenever GWS went forward it felt like they were going to score. But the Saints also looked dangerous despite their tall forwards at times fighting each other for the ball. They kicked four of the first five goals of the quarter to get ahead by seven points, before the Giants struck back with two late goals to go into the main break five points up. The Giants came into the game without key players through injury and suspension, and the loss of Kennedy – then Nathan Wilson for a period after a head knock – made them vulnerable to an eager opposition. But it was somewhat a game of polish up against sheer effort, with the Saints' kept in the contest through their work ethic and the Giants' at times relying on their class to stay on top. That was evident early in the third term, when St Kilda pushed forward through the centre corridor in open space. Gresham handballed to Jack Newnes, who had time to steady, but only managed a scrubby pass to an in-the-clear Josh Bruce near goal. 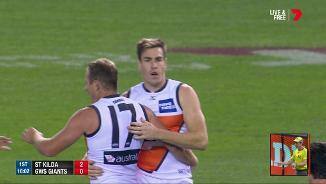 However, the kick was intercepted by returning co-captain Phil Davis, with the Giants quickly flicking it forward and Tom Scully converting a shot from beyond 50 to give his side a 17-point buffer. Somehow, in another strange twist in a hard-to-read game, that stirred the Saints into action. They booted four of the next five goals, including two from emerging youngster Gresham, to square things before a brilliant long goal from Smith helped the Giants to a reduced lead of seven points at three-quarter time. Smith's goal didn't halt the Saints' charge though. Acres' pair of goals to start the term, then another to Bruce, gave the Saints a buffer. And when Steven capped a brilliant night with a barnstorming goal, it was game over, with the Saints snapping an 11-game losing streak on the Friday night stage. St Kilda: The Saints appeared to get through the game without any major injury concerns. Greater Western Sydney: Adam Kennedy hobbled from the field in the first quarter with a left knee injury that had club medicos working hard on the bench before moving to the club's changerooms for further treatment. The club fears the defender has injured his anterior cruciate ligament but will confirm in coming days. Nathan Wilson was left groggy after being slung in a tackle and hitting his head on the Etihad Stadium turf. He sat out the rest of the second term but returned to the field in the third. 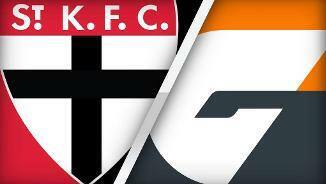 St Kilda will host Carlton next Saturday at Etihad Stadium, with the Giants to look to bounce back when they host Collingwood at Spotless Stadium in Sydney also on Saturday afternoon.